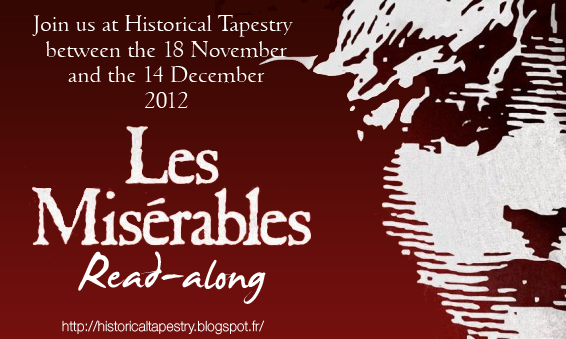 Historical Tapestry: Les Miserables Read-along: are you ready ? Les Miserables Read-along: are you ready ? I don't know if you are feeling just like me right now: intimidated and excited. Intimidated because I started doubting that I could read this book in less than a month (but then I thought that we are doing this for fun, so no need to feel any pressure); excited because I know it will be fantastic to read it all over again! Anyway, we'll meet every weekend to talk about how things are going on and just exchange thoughts. Those who are interested to discuss a particular aspect of the book or ask a specific question to the other readers, you can send them to us by email and we'll publish it under your name during our weekend chat. To participate in our Read-along don't forget to leave your blog/tumblr/facebook/website address in our Mr Linky. 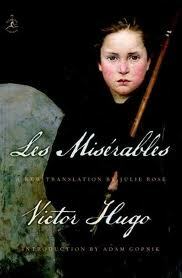 Let the Les Misérables Read-along 2012 begin ! I downloaded the complete book onto my iPad. (Free) I'd love to join this and will write about it tomorrow and come back and link to it. I'd already began reading the same edition you have back in late September. I'm on page 800. Does this mean I can still read-a-long with you? Welcome to our read-along ! Hi very keen for this read-a-long makes the size of the book seem less daunting. I had planned to do this one but have realized it's not reasonable at the moment, as I'm in the middle of a Bleak House readalong and only a third of the way finished with the book. I just don't think I can handle another big book at the moment! But I hope everyone who participates has a great time--I love Les Mis! I REALLY want to read this so I'm giving this read-a-long the ole college try. Wish me luck and thanks for hosting! Bleak House is another book that I would love to reread. Another time !